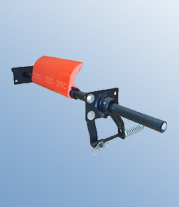 The Belt Cleaning Unit is an aggressive head drum cleaner consisting of a multiple blade section, in line, mounted just under the Tangential centre line of the head pulley, to remove the bulk of the carry back material to return to the main flow of product being conveyed. 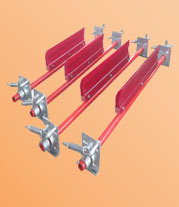 The cleaner is mounted underneath the head drum to ensure no material build up occurs on the cleaner unit, and to eliminate the risk of damage from the cleaner to the belt.Each blade is individually mounted with a rubber tensioning cushion to ensure even blade pressure across the face of the head drum. Tungsten carbide blades are used for fully Vulcanised Belts and Polyurethane Blades are used for mechanically fastened belts. 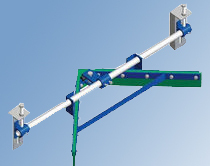 The Unique Belt Cleaning System is an aggressive head drum Cleaner removing the bulk of the carry back material to return this to the main flow of product being conveyed. The System allows each side of the cleaner to act independently of each other thus providing the even distribution of cleaner blade pressure on the belt while allowing the blade to follow any variation in the belt surface. The unique concept of the Belt Cleaner is such that the individual cleaner blades are independent, to ensure even blade pressure across the face of the head drum. 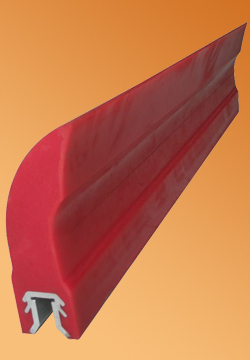 We have recently incorporated a Polyurethane Blade suitable for very dry applications with the Polyurethane Blade being used having its own inbuilt lubrication element to reduce the chances of chattering whilst running on dry conveyor belts.